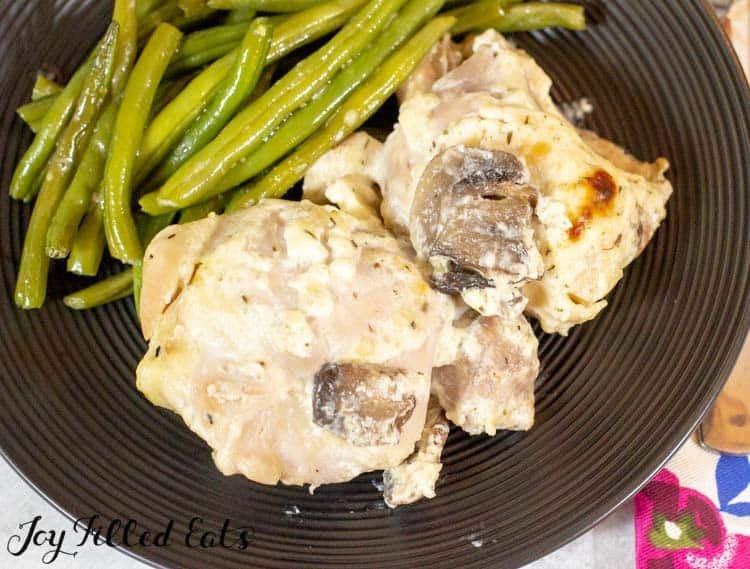 One of my favorite last minute go-to easy dinners are these Baked Boneless Chicken Thighs with Mushrooms. With only a few minutes of prep, you can pop these into the oven and move on with all the million other things you have to do. 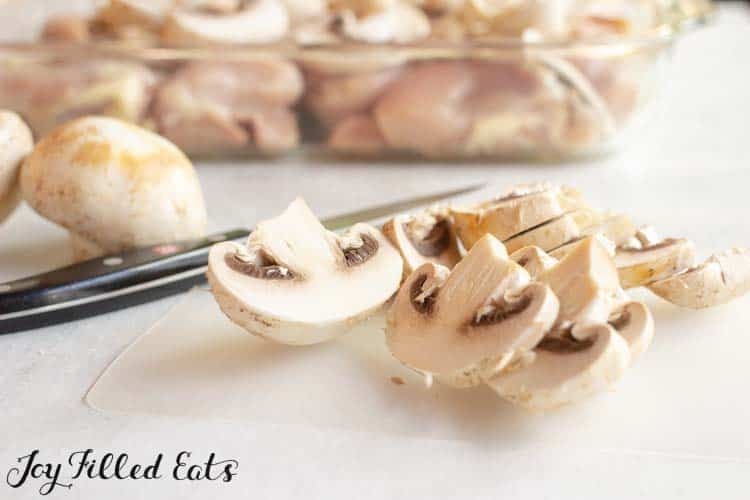 This recipe for baked boneless chicken thighs with mushrooms is perfect when you are pressed for time. Dinner time in my house can be crazy. My baby/toddler (who just turned one so he’s kind of in that in-between stage) has decided to go down to 2 naps. One is at the traditional after lunch nap time and the second falls right before dinner. While I normally cook. Which would be fine IF he would nap in his crib. But he much prefers napping on top of mommy. The period of time my babies are actually babies is so short that I tend to spend much of my day holding them, cuddling them, nursing them, and enjoying the snuggles. It’s lovely. Except when I need to cook dinner. Meals like this that I can prep, pop in the oven, and then go nurse my baby, are essential. It is really easy to bake chicken thighs. Must easier than baking chicken breasts. The main reason is that chicken thighs work much better than chicken breasts when you can’t babysit the oven. They are harder to dry out than white meat. If I make it back to oven after 50 minutes instead of 40 I haven’t ruined dinner. The pork chops I made the other night, not so much. 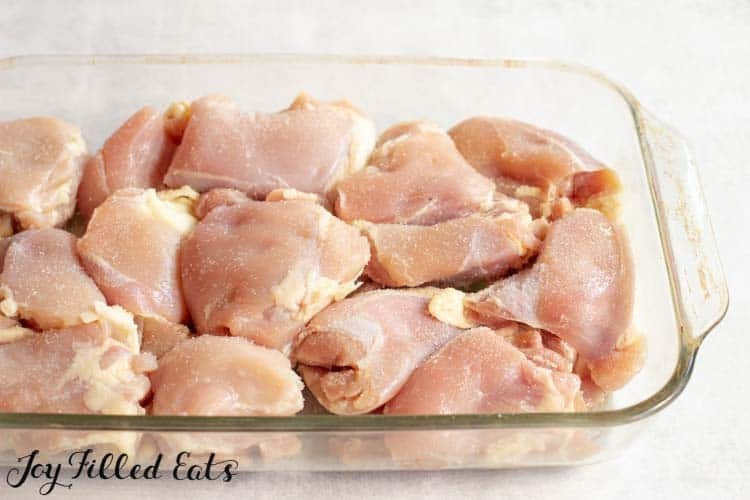 Since these boneless chicken thighs are packed pretty tightly into the 9 x 13 glass pan they take 40 minutes. If you spread them out on a rimmed baking sheet they would cook a little faster. In my opinion 40 minutes, and then 10 minutes with the sauce, is a perfect amount of time to get everything else done while they bake. Mushrooms are also easy to bake. The one problem that you can have is they release so much liquid while baking. This is why if I’m going to use them in a casserole I’ll saute them first or drain the liquid part of the way through cooking. 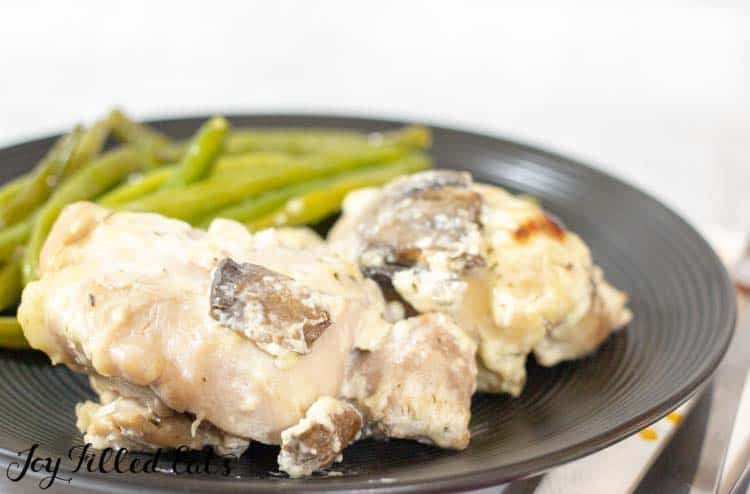 In this Boneless Chicken Thighs recipe, you drain the liquid before adding the sauce so baking the mushrooms with the chicken works really well! This parmesan sauce is what kicks up this simple dinner to the next level. Parmesan cheese, garlic, mayo, sour cream, thyme, salt. Mixed together they make one delicious parmesan sauce. This parmesan sauce is also an excellent dip for raw veggies! As I was cutting the mushrooms I set a couple aside to dip in the sauce when that was ready. This is also similar to my Caesar salad dressing. 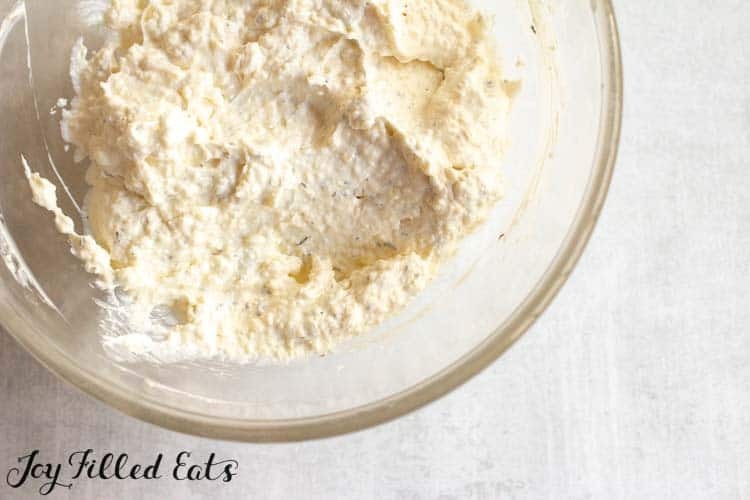 That has only 4 ingredients (no thyme, and salt doesn’t count) and is a favorite among my family. All of my children have 2 or 3 helpings whenever we make it. When I make baked boneless chicken thighs the one trick I have is to drain the cooking liquid before adding the parmesan sauce. The chicken thighs release a lot of natural liquid as they cook which can thin the sauce if you add it in the beginning. 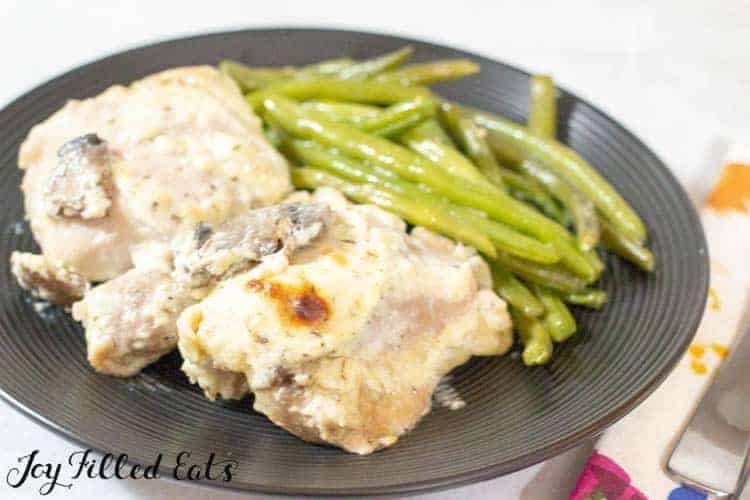 Besides this recipe for Chicken Thighs with Mushrooms, we also love my other Chicken Thighs Recipes: Easy Chicken Fajita Casserole, Sweet Maple Mustard Chicken, and Low Carb Chicken Pot Pie with Biscuit Topping. 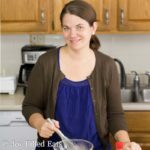 What is your favorite way to make chicken thighs? 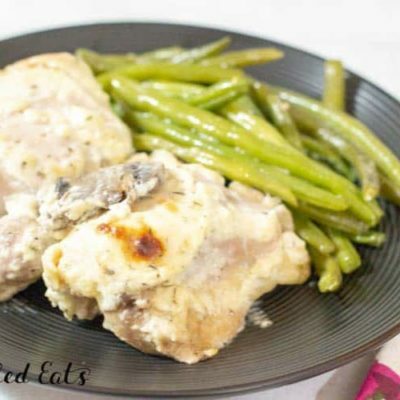 What to serve with baked boneless chicken thighs? We normally default to the old favorite steamable bags of veggies. On more special occasions I’ll make Roasted Brussels Sprouts with Garlic, Garlic Broccoli, Caesar Salad, or sometimes I’ll make my fantastic Mashed Cauliflower with Cream Cheese. 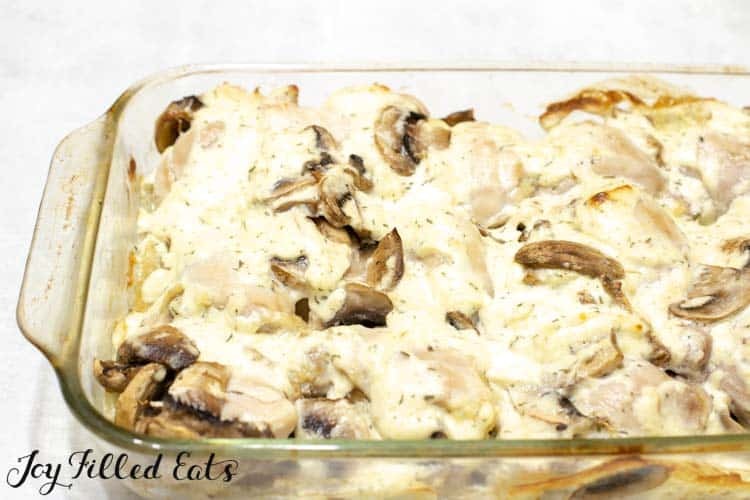 Baked Boneless Chicken Thighs with Mushrooms. 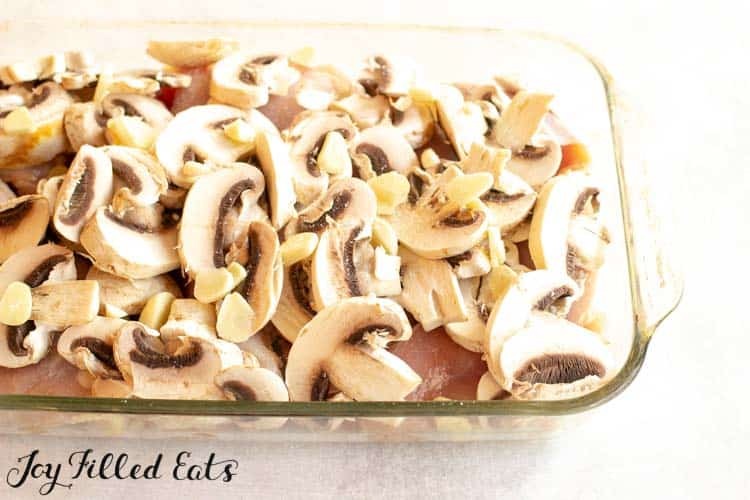 Put the chicken thighs, mushrooms, and garlic in a 9 x 13 baking dish. Cover with foil. Bake covered for 40 minutes. Carefully drain the cooking liquid. Meanwhile, stir together the ingredients for the sauce. Add the sauce onto the chicken after you drain the cooking liquid. Bake uncovered for an additional 10 minutes. This recipe is fabulous! My husband gave it a 9.5 (on the 1-10 scale) which is most unusual. I am wondering if you used fresh thyme? I didn't have any fresh, used just 1/4 tsp of the canned stuff, I feel like a full teaspoon would have ruined it. Also, try this on baked white fish for some additional awesomeness! Final note, my blood glucose reading also appreciated this recipe. I used dried thyme and didn't find it overpowering. You are more than welcome to cut back on any herbs to your preference. Can I sub the Parmesan for mozzarella or Monterey Jack? Is a serving (as per nutrition chart) one thigh or two, please? It should be 2 unless you have very big chicken thighs. It is calculated by 4 lbs divided by 8 servings. That is an 8 oz portion of chicken. Made these last night and they turned out great! Thanks! Chicken thighs are my favorite part of the chicken. I'm also a huge mushroom fan so I know this recipe will be one I'll make time and again. Thanks for sharing!